Forests of Michigan’s Upper Peninsula are a transition between northern hardwoods and northern conifers. In some locations the primary stands are deciduous trees with an occasional mixture of pine and hemlock; elsewhere the steeple-topped spruce and fir predominate. In the northern hardwood-conifer type forests, extensive stands may be almost pure maple but usually some beech, ash, basswood, paper or yellow birch are intermixed. The conifers, when present are generally white pine and hemlock although red pine, white and black spruce, balsam fir, and northern white cedar occur in some locations. The conifer, or boreal type forest is not extensive in the Pictured Rocks region. Where the dominant conifers do stand, with their associated white birch, quaking aspen and mountain ash, the visitor can savor the essence of the north woods. Other interesting types of tree communities include the coniferous swamps (containing the black spruce, fir, tamarack and white cedar) and, on drier sandy soils, stands of red or jack pines with an under story of bracken ferns. Along with the trees are many interesting smaller plants. In the spring the yellow violets, squirrel corn, Dutchman’s-breeches, orchids, trilliums and pitcher plants add their beauty. When fall arrives the blueberries join the maple, beech, aspen, and other trees in an array of color. Michigan’s Upper Peninsula is well known for its variety of animal life. The large number of whitetail deer present is indicated by a definite browse line within the area. Bear range throughout the area and wolf may occur. Otter, coyote, fox, bobcat, porcupine, beaver, and snowshoe hare are typical large mammals. Northwood birds are well represented. The goshawk, bald eagle, ruffed grouse, three-towed woodpecker, gray jay, raven, hermit thrush, golden crowned kinglet, the northern warblers and the crossbills inhabit the proposed lakeshore. Loons and black ducks are seen on the larger inland lakes. A combination of cool climate and pure water of the streams and lakes provide an excellent habitat for fish. Brook trout are in the streams. In the spring, steelhead trout from Lake Superior enter the streams to spawn. Larger lakes contain spiny-rayed fish and members of the pike family. 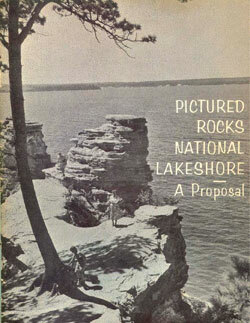 The climate of Pictured Rocks region is common to the northern Great Lakes -- severe winters and warm summers. Marine influence of Lake Superior, however, has a moderating effect on temperatures: winters are milder and summers cooler than locations farther inland from the lake. The average daily high in the Pictured Rocks region during July is 78 degrees, the low is 53 degrees; in January the average daily high is 27 degrees; the low is 12 degrees. Precipitation is rather evenly distributed throughout the year, with a slight increase during the warmer months. The area averages about 31 inches of precipitation annually, including nearly 100 inches of snowfall. In Michigan this amount of snowfall is exceeded only the 160 inches in the mountain range along the northwestern edge of the Upper Peninsula.